Exactly two decades ago today, the Space Shuttle and crew of STS-31 were launched to deploy the NASA/ESA's now famous space observatory, the Hubble Telescope, into a low-Earth orbit. Hubble's unprecedented capabilities have made it one of the most powerful science instruments ever conceived by humans, and certainly the one most embraced by the public. Its discoveries have revolutionised nearly all areas of current astronomical research, from planetary science to cosmology. At times Hubble's space odyssey has went on with broken equipment, a bleary-eyed primary mirror and even a Space Shuttle rescue/repair mission cancellation. But the ingenuity and dedication of Hubble scientists, engineers, and NASA and ESA astronauts have allowed the observatory to rebound time and time again. Its crisp vision continues to challenge scientists with exciting new surprises and to enthral the public with ever more evocative colour images. NASA, ESA and the Space Telescope Science Institute (STScI) are celebrating Hubble's journey of exploration with a stunning new picture (above). Another exciting component of the anniversary will be the launch of the revamped European website for Hubble, http://www.spacetelescope.org/. The brand new Hubble anniversary image highlights a small portion of one of the largest observable regions of starbirth in the galaxy, the Carina Nebula. Towers of cool hydrogen laced with dust rise from the wall of the nebula. 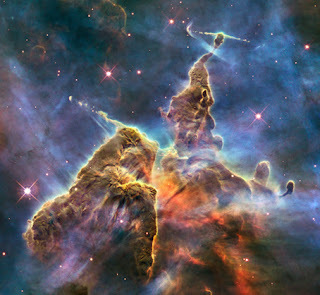 The scene is reminiscent of Hubble's classic Pillars of Creation photo from 1995, but even more striking in appearance. The image captures the top of a pillar of gas and dust, three light-years tall, which is being eaten away by the brilliant light from nearby bright stars. The pillar is also being pushed apart from within, as infant stars buried inside it fire off jets of gas that can be seen streaming from towering peaks like arrows sailing through the air. To date, Hubble has looked at over 30 000 celestial targets and amassed over half a million pictures in its archive. It is set to be replaced by the James Webb Space Telescope which will be launched in 2013.